As Christmas approaches, so does the annual tradition of gift exchanges at Christmas parties or ‘secret Santa’. It’s super common to see people around you scratching their heads and losing sleep over what to gift their friends and loved ones. In fact, a recent survey by Rakuten highlighted that Singaporeans spend an average of 70-93 minutes just to find the right Christmas gift. In a party with lots of people, the last thing you want is to give the wrong type of present, or worse, be that uncool guy getting caught re-gifting something (which still has a greeting tag with his name on it!). If you're like me, who has the very enviable habit of leaving gift exchange shopping to the very last minute and hoping that my very last minute gift does not get called out as lame, here are 10 gift exchange ideas that may help. The best part? They all cost under $20. We all have a wanderlusting travelbug of a person in our life. 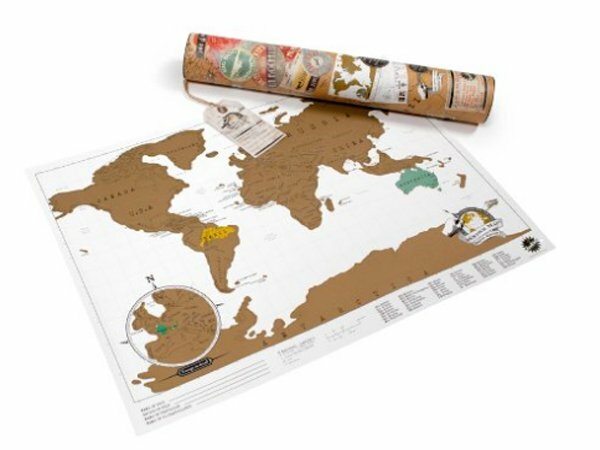 Now whenever he/she travels somewhere new, they can mark off where they've been around the world by scratching off that destination on the map. So you're a 19-year-old boy, and you just found out your secret Santee is a girl. The last time you bought something for a girl was a My Little Pony set for your little sister. What on earth will you get for her!? We're here to help. This lipgloss and nail polish set is a delightful way for any girl to pamper her lips & tips. Best of all, it comes in a classic burgundy-pink shade that can't go wrong. Customisation is cool. This notebook set comes with an embossed gold initial letter you can match to your recipient's name. It also comes with an attachable pen. It should also put a smile on your face as it only cost $2! If you have a group of friends to purchase gifts for, this seals the deal. With great power comes great... battery drain. In today's world of Googling everything, your friend will never again have to say "Aiyah my phone died..." with a portable power bank. A typical power bank should set you back around $20, and is easily available at any electronics stores like Challenger, and Courts. Yes yes, we get that almost everyone uses their iPhone calendar to remember important dates and events. But with Stars Wars making such a huge comeback now, you'll be the relevant cool one by gifting this. Featuring a print on each page with a weekly layout, this diary is sure to help that blur friend of yours keep organised for school in 2017! There is just something about Nerf Guns that bring out the child in all of us. Gone are the days where guns are only "appropriate" for boys. This is a great gift for both guys AND girls. Do not underestimate the girls. I've seen some play Left4Dead2 before, and I secretly think they might be better at it than guys. Get Nerf Guns from any toy stores, but Toys R Us is likely to have a larger variety. A water bottle that's sure to get some "oooh"s when it's whipped out. Looking like a cubism masterpiece created by Picasso, this rectangular bottle is not only pretty to look at when filled with water, but it's also odor, shatter, and stain resistant. If you have a really messy study buddy who constantly pulls out tangled iPhone/laptop/earphones cables from his bag, and just can’t seem to get his cables together. Let this cable dog lend a hand (or paw!). For that extra fabulous person in your life. Allow his/her personality to shine through their laptop with this decal. It's also directly imported from Germany, and easy to remove without leaving glue-y stains all over the laptop. The Nite Ize PetLit LED Collar Light is the perfect gift for any pet owner you know. It clips to a pet's collar, and transforms it into a stylish and visible furry friend all night. A fun and reliable way to keep a pet safe and visible when out running/walking/Pokemon Go-ing at night.